Since I got help clearing away all the windfelled trees around the house of my smallholding I have started working on the forest garden I wish to establish there. 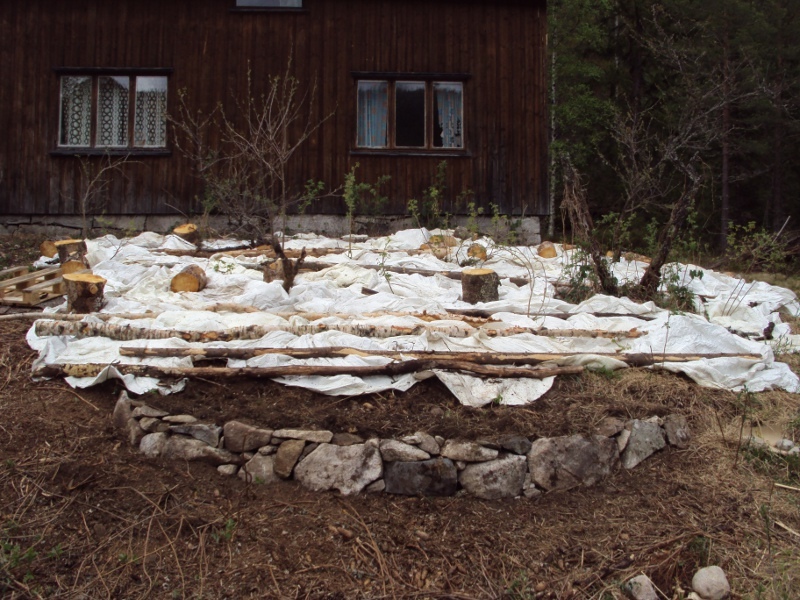 I’ll tell you a bit about my goals in general with my forest gardening, why the previous forest garden I started is not doing particularily well and what changes I have done to this one. My goal with forest gardening is to create a system that requires very little energy to maintain and expand, giving a fair variety of plants to add to the wild diet, sheer calories being more important than nutritive foods, which are already present. Per hectare productivity is less interesting to me, since the size of the area available is not a limiting factor. Because of this, it is at least as important to me to improve habitat for game species. I will try to focus plant species around locations where I’d otherwise be during harvesting time exploiting other resources like game and fish. No native species will be eradicated, only their proportional occurence changed. Clearcutting small patches of spruce forest, planting in oaks, siberian pine and hazel. These produce lots of calories in the long run and provides plenty of food for wildlife species that are desirable to me (like squirrels). 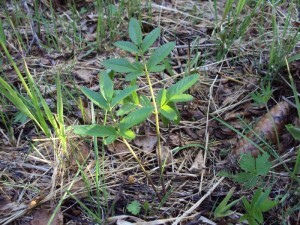 Oaks also improves the soil greatly. Planting hardy, preferably native and easily propagatable plants. For instance: The local varieties of sour, sweet cherry and plum sucker freely and can be divided with success at most times. Same is true with the local Ribes species. 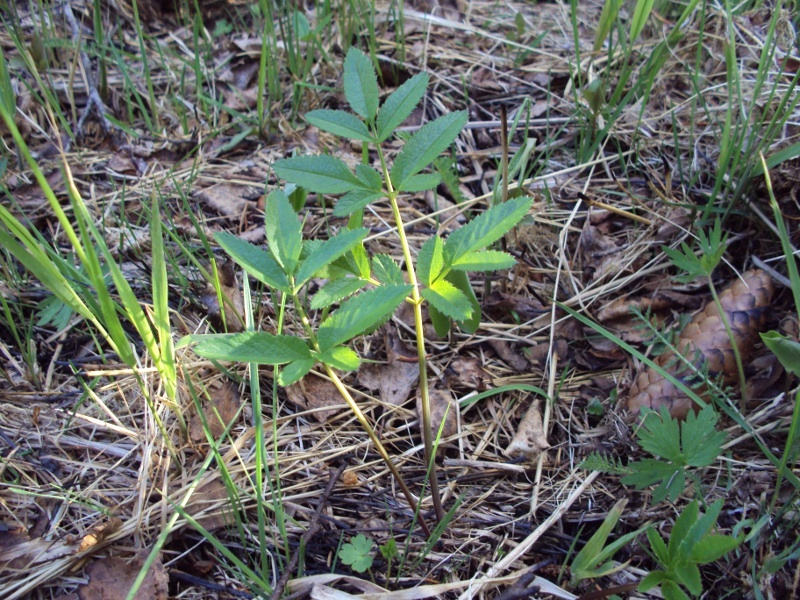 Give very little attention to the herbaceous layer, since there already is a number of very good plants growing wild in the area and which may spread if the soil improves. Will mainly introduce comfrey and nitrogen fixers. Burning the ground (meadows and some forest types) to shift the species mix and rejuvenate the vegetation. As of yet my experiments with burning vegetation seems to favour plants which are quite productive, such as valerian (seeds) and angelica (greens and root). But I’ll know for sure in a few months. Graft domestic apple on wild rowan shoots and plums/cherries onto bird cherry. It is too early to tell whether my experiments this spring were successful. I am also competely inexperienced in grafting, so I will not write off these combinations even if the grafts this year seem not to take. Spreading plants marginalised by centuries of overgrazing and senseless management. For example elm, maple, linden and ash. These are all favourable to wildlife and improves soil conditions more than the currently dominating spruce. In my previous forest garden I thinned a predominately birch dominated forest to bring in more light to the cherries, plums, currants and herbs I planted below. I thinned the forest too little and the cherries have died from the competition. The plums and the currants look alright and will probably survive if I thin the trees out yet a little more. The young hazel bush that was already there has however benefited from my activity. In the site of the smallholding itself quite a number of very good food species are already existant, but their proportion is not so useful and their interaction is more one of competition rather than mutual support. The fallen spruces on the site has acidified the soil and provided excellent habitat for rampant spreading of wild raspberry and hops. This has killed one of the 5 existing sour cherries and significantly damaged two others. The situation has been taken care of now, through removing the felled trees and the branches and sheet mulching the area were the problem was the greatest. 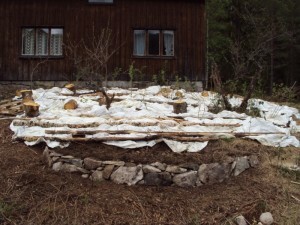 To improve the recovery of the surviving currants and cherries, sheep manure and shell sand was spread on the ground before the sheets were laid on. A few raspberry and hop plants were left to survive, the dead cherry was left for the hops to climb on. Although it isn’t strictly necessary and since I have manure available I have planted in a very tradtional way. 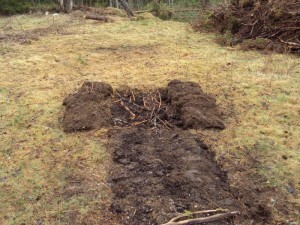 I make a hole several times the size of the roots of the tree, both depth and width. Then I packed a thick layer of manure in the bottom, made a packed layer of earth above there and then planted the tree the regular way. Then I watered the soil to complete saturation in order to take out any air pockets. This method will appearantly ensure good rooting and early growth. I was informed by my father that the traditional way of planting potatoes in the area was to spade up the turf and plant the potatoes underneath the turf. Being somewhat worried about a potential weed problem with this method I did some modifications. I turned the turf upside down and piled some half rotten branches, manure and shell sand underneath, then watered heavily as with planting the trees. On the surface I sowed the seeds of white clover to hopefully work as a living, nitrogen fixing mulch. The propagation beds were done in the same way. It is worth noting that I haven’t been to the site for over 3 weeks now, so I have no idea how things are developing right now. I’ll update on it further when I get back home. Torjus, I look forward to seeing how it goes. I am glad to see you are back.